Four winter-hardy faba bean germplasm lines developed by Agricultural Research Service (ARS) scientists and their collaborators are now available for further development. The faba bean, Vicia faba, is among the oldest domesticated crops and is grown worldwide for food, feed, and forage. It can also serve as a cover crop that converts, or "fixes," atmospheric nitrogen into a form subsequent crops can use for growth. Its tall height and thick canopy also help shade out weeds. And when chopped and left in place to decompose as a "green manure," faba plants can protect and nourish soil. Current U.S. varieties can tolerate cool temperatures and light frosts, but they do not possess true winterhardiness. Shoring up the trait could allow growers to use faba bean as a winter cover crop. Growers could also save fertilizer costs and earn income from harvesting the seed. "In the Palouse region, pea, chickpea, and lentil are currently used as rotation crops with wheat, the main crop," says geneticist Jinguo Hu, who leads ARS's Plant Germplasm Introduction and Testing Research Unit in Pullman, Washington. (The Palouse covers parts of southeastern Washington and northwest Idaho.) "Faba bean has potential to extend the crop diversity in this region and elsewhere." 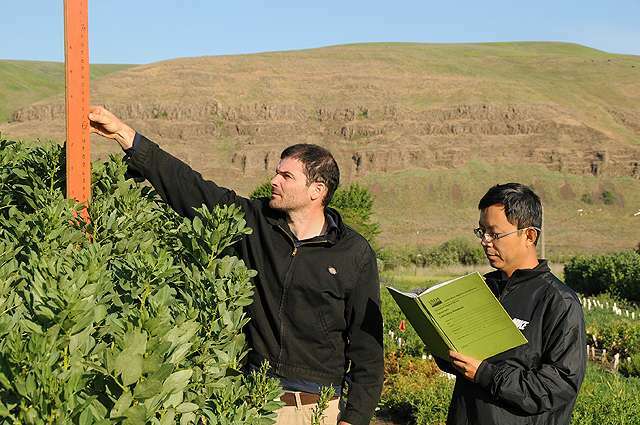 In October 2008, Hu and his fellow geneticists at the ARS research unit and Washington State University-Pullman began an intensive screening effort to identify sources of winterhardiness in faba bean. They began with 175 accessions (samples) chosen from a faba bean germplasm collection maintained at the ARS Western Regional Plant Introduction Station in Pullman. Among these accessions were commercial cultivars and breeding lines obtained from northern Europe, where cold tolerance is essential to successful faba bean production. From the 175 accessions, the team chose several promising faba bean lines with winterhardiness comparable to that of the European lines, which were used as controls in the trials. To further enhance the trait, the researchers produced six total generations of offspring plants from each line to methodically refine their search for the hardiest individuals. Ultimately, they chose four lines of European descent that had an average winter survival rate of 84 percent during 2013-2014 field tests at three farm sites in southeastern Washington, where winter temperatures ranged from 50 °F down to -12.5 °F. Hu says the four faba bean lines were also selected for seed size and quality, flowering, and suitability as a fall-sown cover crop for dryland grain-production systems—particularly in the hilly, fertile Palouse. "These lines will also be useful in other regions up to USDA plant hardiness zone 6b as a cover crop, green manure, or grain crop," says Hu. The research findings appeared in the August 2015 Journal of Plant Registrations.